Should You Cover Your Air Conditioner During the Fall and Winter? There are a lot of things to do to prepare during the fall for the upcoming colder weather such as prune trees and bushes, fertilize the lawn, weather strip the windows, caulk any foundation cracks, and split up your perennials. But what about the air conditioning unit outside? Should it be covered along with the grill and the patio furniture? Well, the answer is… maybe. You should consider the pros and cons, then decide for yourself whether or not it’s beneficial to cover your air conditioner in the “off” season. Fall is called “fall” for a reason—and it has mostly to do with the falling leaves. Blustery winds often help the trees with their shedding, and a cover over your air conditioner will help keep leaves, seeds, twigs, and other debris out of your unit. This organic debris can clog up in your equipment and hold moisture, leading to rust and corrosion of the parts. Additionally, a cover can help prevent that outside material from getting into the drain system and clogging that up, so it won’t drain properly when you’re using it next spring. 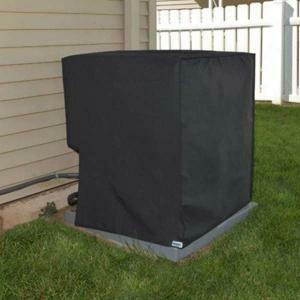 A cover can also help protect your condenser coils by keeping water from resting on the coils and freezing. Manufacturers don’t generally require covering the unit to protect it from the elements as it is built to endure the outside elements, including rain, wind, and snow. Therefore, if you cover the unit up completely, you can actually trap moisture inside which will cause rust and corrosion. And ironically, that trapped moisture can freeze on your coils during the cold months, eventually damaging them. Additionally, trapped moisture can lead to mold growth—and it’s not so great for the electrical wiring and circuit boards inside either. Full covers also have one more drawback—they are irresistible to shelter-seeking rodents who are looking for a warm winter home. These new residents like to chew up wires to create bedding for nests, and that’s obviously not good for your equipment. A cover is actually helpful, but only if it’s the right cover. Since the top of the unit is the part that is critical to protect, that’s the part that should be covered. You can use something as simple as a sheet of plywood over the top. If you want something more pleasing to the eye, you can get a cover that protects the top and doesn’t come down more than 6 inches on the side. This will keep the bulk of the debris at bay and still keep the sides open for escaping moisture. There are also covers that cover the entire unit but are made entirely of mesh. They do the same job in a different way. These covers also have the added advantage of not providing a cozy barrier from the cold that attracts rats and mice and other rodents. Whether you choose to cover your outside air conditioning unit in the fall and winter or not, you should still have it checked over during that time by an HVAC professional. Regular maintenance helps keep your heating and cooling equipment clean and efficient—and extend the life of this important home system.